Beautiful, beautiful image, Lisl...one of the best in your excellent portfolio, IMHO. Oh this is so great! I love the guy looking at you!!! Have a wonderful walk Lisl! Lisl: I was pleased to get at least one looking, Elizabeth. Walk was VERY slippery! Fabulous shot, absolute delightful colours. Have a great walk and please don't forget to take some pictures. Lisl: Good for riding, Chad! Oh-Oh-Oh. What an image to leave us with, Lisl. I'm sure you'll have a great week away and will come back with incredible images to show us! This is a superb image. Enjoy your break..and I wish you good weather! I love it, wonderful composition and dof Lisl. Ohh' lovely shot, Elisabeth,it has a really nice feel to it. Enjoy your walk. Lisl: Thank you so much, Frank. I was meant to be birding, looked through the slats of a "blind", and found these the other side! A fine capture Elisabeth, great colour and textures, enjoy your trek! Lisl: Thank you on all counts, Fred. Wish I could be doing the same. Have an excellent time. Excellent shot , by the way. Wonderful capture Lisl. Enjoy the walk! Lisl: Thank you, Richard. The walking was not as good as usual - we have just had the wettest June on record! This is like a piece of art, Lisl. A Likey for me. Lisl: That is very kind of you, Beverly. Thank you. I really like this sort of cattle. Enjoy your break, we are away from Friday for a week, in Norfolk. Lisl: They are very photogenic, aren't they, Brian - enjoy Norfolk. 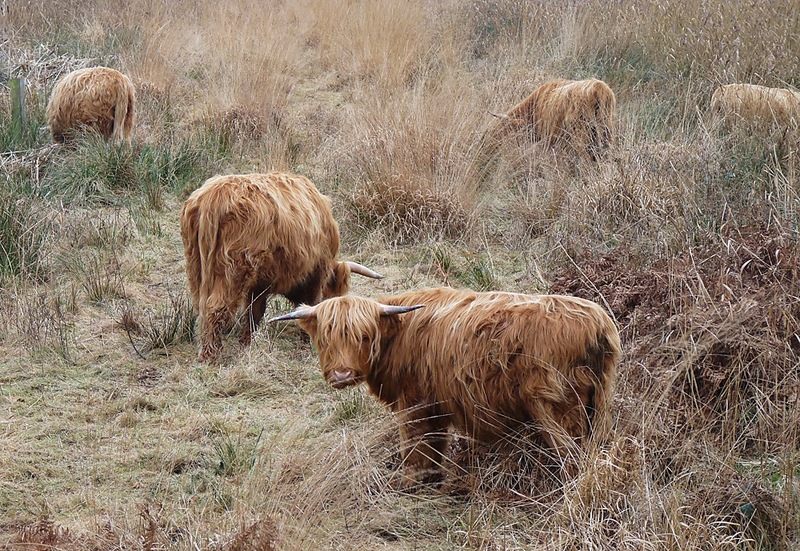 Gorgeous, I am fond of highland cattle. I hope you have a great few days away. Lisl: Thank you very much, Jacquelyn. It's always good to get away, even if it did rain and rain and rain! Have a good trip Lisl and what a capture to leave us with. A really fine group, Lisl.